No. 818, Dashun 2nd Road, Sanmin Dist. Compact and powerful – that is in a few words what the new CoolStack® LED grow lights stand for. With a market leading PPF light output of 1.500µmol/s out of a 600 watts LED grow light, the CoolStack® is the ideal alternative for SON-T assimilation lighting in greenhouses. While the efficiency and technology of SON-T HPS grow lights has stabilized over years, the gap with LEDs used in horticulture assimilation lighting becomes bigger and bigger. Just a few years ago we could still discuss if LED grow lights would offer a major advantage over the well-known and proven technology of HPS Son-T lamps. Today it is clear that the near future of horti assimilation lighting is completely turning in the direction of LED technology. But the CoolStack® is more than just another LED grow light – it is a state-of-the-art grow light platform with an unprecedented level of technology and vision in it. As an example discover how we made the CoolStack® the first sustainable LED grow light on the market. With a life time of 75.000 burning hours this stand equivalent to 25 years of use at a yearly rate of 3.000 hours of deployment. Of course in that time the technology and efficiency of LED grow lights will drastically change and improve. Therefore we have designed the CoolStack® in this way that the LED grow light engines can be replaced and updated over time. 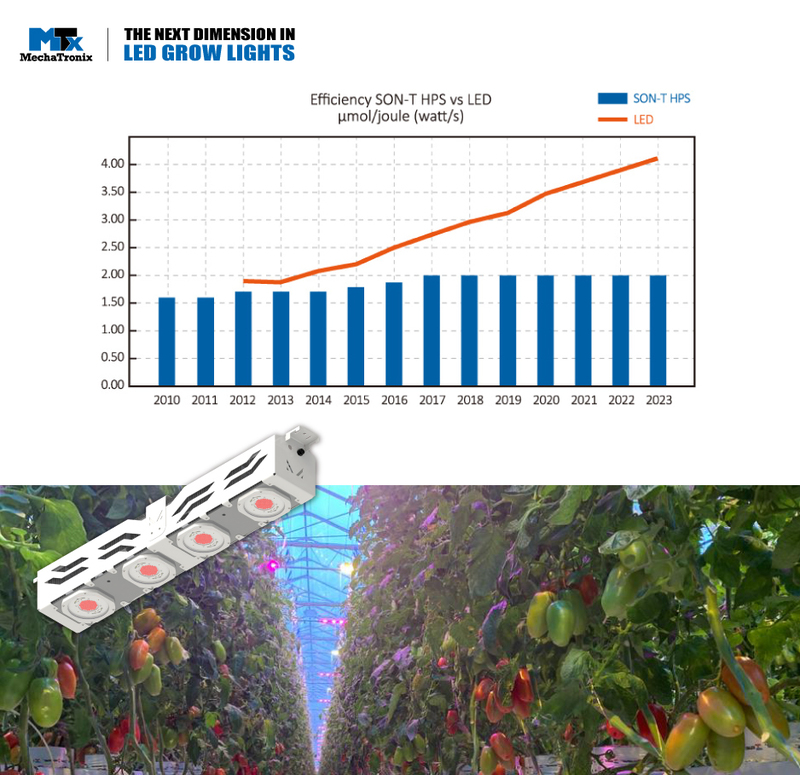 Did you know that the LED emitters only count for 30% of the total cost of a grow light, and that the expectations are that this percentage will further decline over time when the LEDs become cheaper? So why would you throw away 100% of your investments after a few years when you want to upgrade to the next level of market efficiency in grow lights while you could do that with just a part of the cost? This is how we contribute, not only in your current and future investments in LED grow light, but also in the sustainability we cherish. The HAS University in den Bosch The Netherlands is one of the most famous universities in Europe when it comes down on horticulture and applied science knowledge. In their own professional greenhouse facilities they cultivate a wide variety of crops. Since September 2018 the HAS and MechaTronix partner on assimilation light trials for strawberries. In a first plant trial strawberries from the Sonsation cultivar are grown under both SON-T HPS lamps and de CoolStack® LED lamps from MechaTronix. Sonsation has been developed by the Flevo Berry breeding program and is a rather new cultivar which produces bright red berries with an intensive gloss. In the trial both with HPS and LED the PAR light level PPFD is set at 200µmol/sm² as there is a strong upward tendency to cultivate under higher light levels. The plants went in the greenhouse on September 3rd. All parameters like harvest, brix, vitamin C, ambient conditions etc are logged by a dedicated team of the HAS. More insights in the Sonsation Strawberry trial and the results or planning a visit to the trial? Who cultivates paprika in the west side of Europe for sure knows the Research Centre Hoogstraten (PCH) in Belgium. Research Centre Hoogstraten (PCH) is located in the north of Antwerp in the middle of an important horticultural area.Since its foundation in 1955 the centre plays an active role in the development and growth of the horticulture in the region and abroad. A team of 42 professionals run over 160 plant trials per year with specialization in greenhouse cultivation techniques for strawberries, tomatoes and parika. 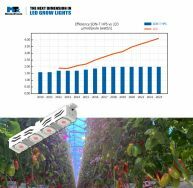 In the light of innovative new cultivation methods, MechaTronix and the PCH started an advanced trial on paprika growth under LED grow lights. The trial runs from October 2018 onwards. Various light level intensities are created in the greenhouse ranging from a PPFD of 80µmol/sm² all the way up to 280µmol/sm². More insights in the PCH paprika trial and the results or planning a visit to the trial? When you send a mail to horti@mechatronix-asia.com we sign you up for a regular update or a full report share. A good example of the wide interest of MechaTronix in the specialization in a broad crop variety knowledge is this advanced plant balance trial on Bromeliads. In this trial the BCO Bromelia, a division from the LTO Glaskracht, Plant Lighting, Botany and MechaTronix cooperate on finding the ideal growth circumstances to grow bromeliads in the Netherlands and Belgium in a greenhouse environment. As cultivars Guzmania and Vriesea where selected. The trial runs from October 2018 onwards. We challenge you to go arm-in-arm with us on your horticulture grow light adventure and guarantee you a unique journey.